1. Sapphires have been treasured for thousands of years. The ancient Romans as far back as the 7th century B.C. polished sapphires to be worn as jewellery. 2. Ancient Persians called sapphire the “Celestial Stone.” It was the gem of Apollo, Greek God of prophesy and was worn by worshippers visiting his shrine in Delphi to seek his help. 3. 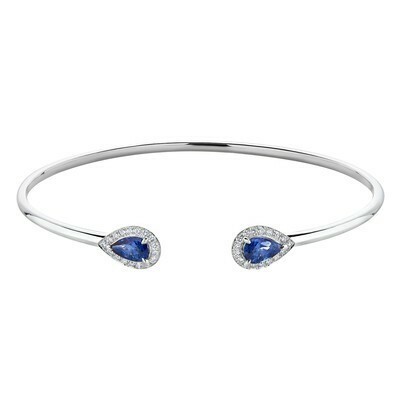 Sapphire was said to represent the purity of the soul, wisdom, loyalty and nobility. 4. The best-known sapphires are the rich blue variety, but they actually come in every colour of the rainbow—including pink, yellow, orange, and green. 5. Sapphire is from the Corundum family and red sapphires are better known as rubies. 6. Sapphires are among the hardest naturally occurring elements in the world. The only natural item that can scratch a sapphire is a diamond. The durability of sapphires makes them an excellent choice for engagement rings and other pieces of jewellery that you plan to wear every day. 7. Because of this hardness, sapphire also has industrial uses, for example the Apple Watch features lab-created sapphire glass in its screen. 8. The most famous royal sapphire today is the engagement ring given by England’s Prince Charles to Lady Diana Spencer in 1981, and now worn by Princess Catherine, Duchess of Cambridge. It features an 18ct oval blue sapphire surrounded by diamonds. 9. Sapphire engagement rings certainly aren’t only for royals. Before the twentieth century, blue sapphires were the favoured gemstones for engagement rings. Sapphires were quite popular in Victorian engagement rings, when they were often surrounded by smaller diamonds to create floral designs. 10. One of the most famous Sri Lankan sapphires rests on the Imperial State Crown, worn by Queen Victoria in 1838. It resides in the British Crown Jewels in the Tower of London. Sapphire jewellery is a popular addition to any jewellery box, September birthday or not.